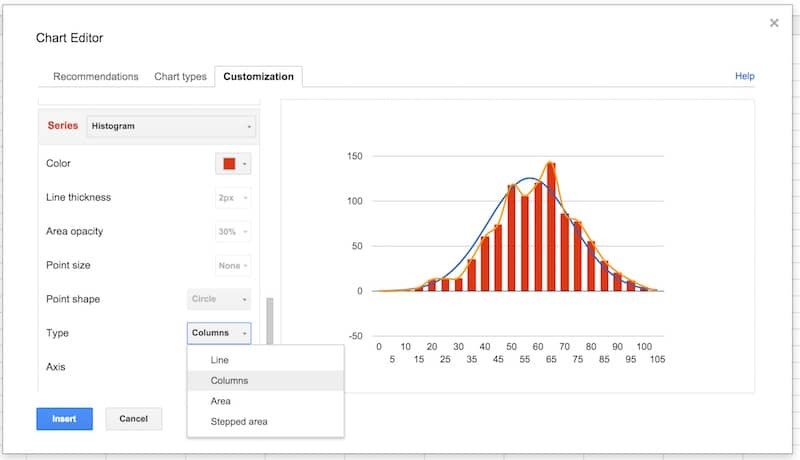 In this tutorial you’ll learn how to make a histogram in Google Sheets with a normal distribution curve overlaid, as shown in the above image, using Google Sheets. It’s a really useful visual technique for determining if your data is normally distributed, skewed or just all over the place. A histogram is a graphical representation of the distribution of a dataset. In this example, I have 1,000 exam scores between 0 and 100, and I want to see what the distribution of those scores are. What’s the average score? Did more students score high or low? How clustered around the average are the student scores? Are the scores normally distributed or skewed? 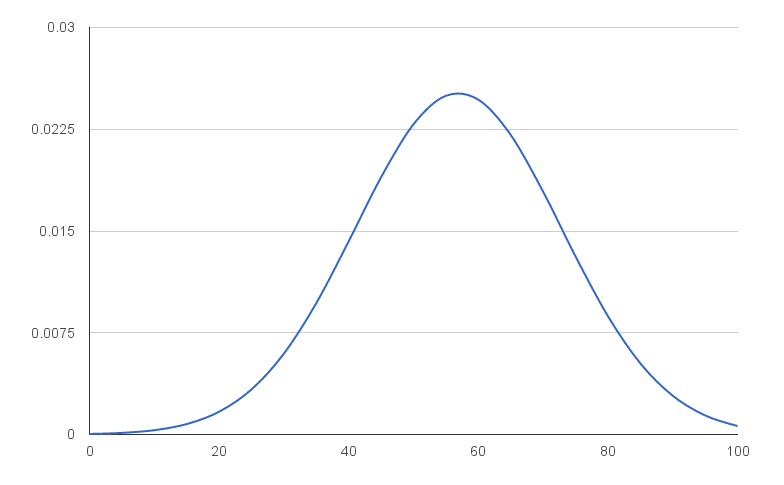 What is a Normal Distribution Curve? The normal distribution curve is a graphical representation of the normal distribution theorem stating that “…the averages of random variables independently drawn from independent distributions converge in distribution to the normal, that is, become normally distributed when the number of random variables is sufficiently large”. Bit of a mouthful, but in essence, the data converges around the mean (average) with no skew to the left or right. It means we know the probability of how many values occurred close to the mean. We expect 68% of values to fall within one standard deviation of the mean, and 95% to fall within two standard deviations. Values outside two standard deviations are considered outliers. We expect our exam scores will be pretty close to the normal distribution, but let’s confirm that graphically (it’s difficult to see from the data alone!). 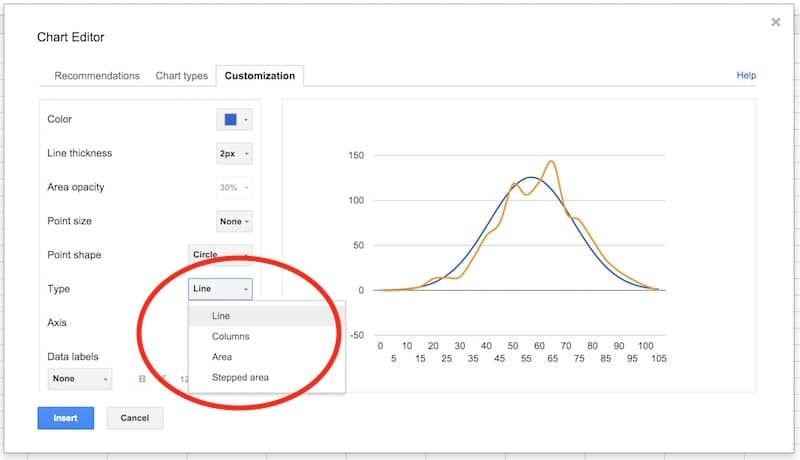 Let’s see how to make a Histogram in Google Sheets and how to overlay a Normal Distribution Curve, as shown in the first image above. Copy the raw data scores from here into your own blank Google Sheet. It’s a list of 1,000 exam scores between 0 and 100, and we’re going to look at the distribution of those scores. (it adds 5 to the cell above). Name this range bins. Let’s set up the normal distribution curve values. 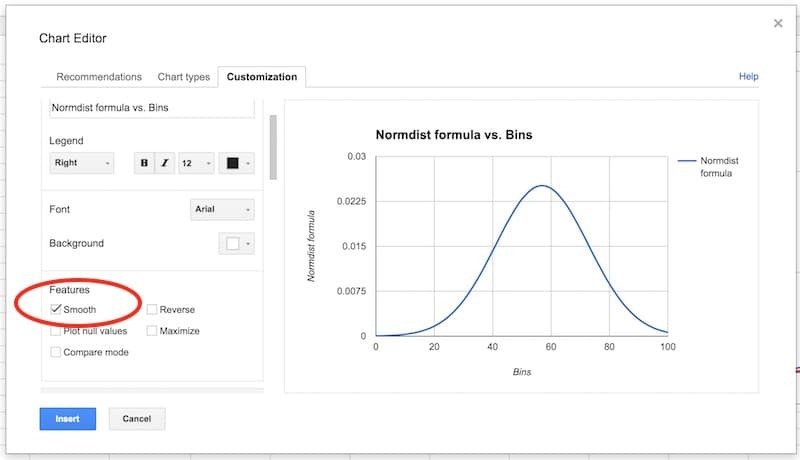 Google Sheets has a formula NORMDIST which calculates the value of the normal distribution function for a given value, mean and standard deviation. We calculated the mean and standard deviation in step 3, and we’ll use the bin values from step 4 in the formula. Let’s see what the normal distribution curve looks like with this data. That’s a normal distribution curve, around our mean of 56.9. Great work! We now need to calculate the distribution of the 1,000 exam scores for our histogram chart. 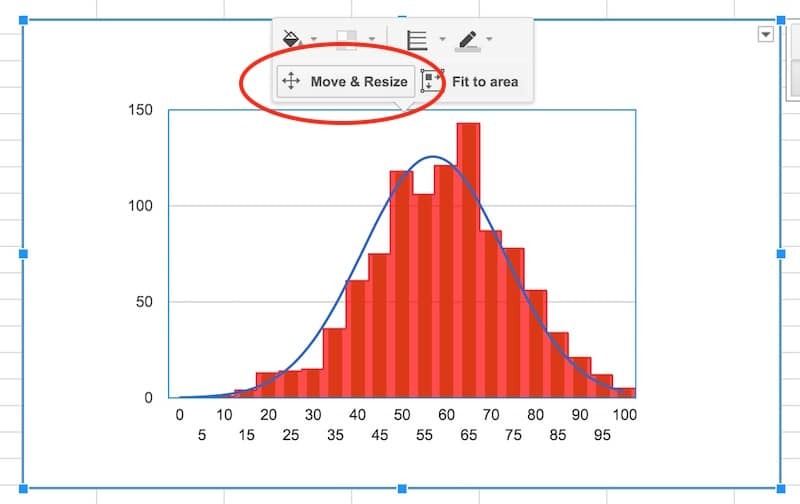 As we’re going to create a totally new chart with the histogram and normal curve overlaid (easier than modifying this one), you can put this normal distribution chart to one side now, or delete it. Leave column H blank for now (we’ll fill this in shortly). 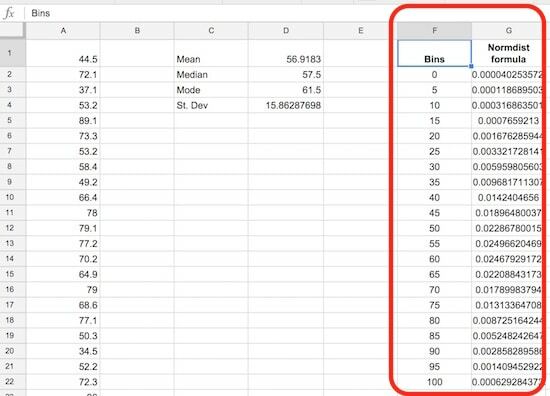 If you’re new to Array Formulas, check out this post: How do array formulas work in Google Sheets? Copy this column of frequency values into the adjacent column J (we need this for our chart). Pro tip: you can just copy I1:I2 into J1:J2, it’ll fill out the whole column with values. 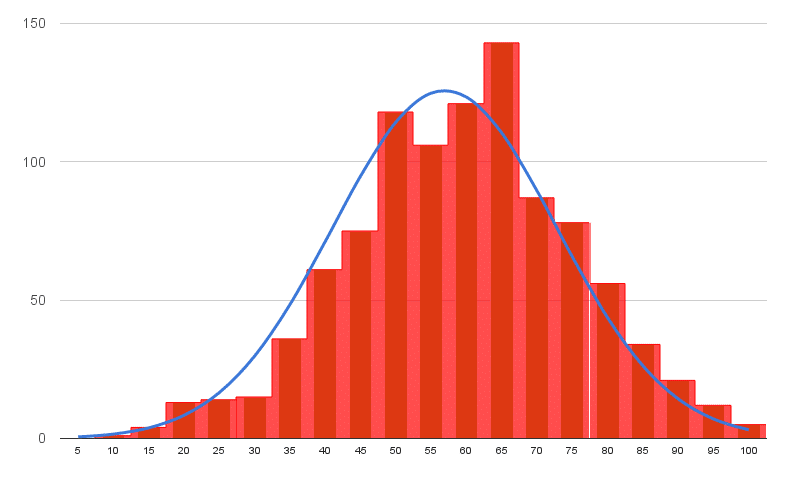 We need to scale our normal distribution curve so that it’ll show on the same scale as the histogram. Since we have 1,000 values in bins of 5, our scale factor is 5,000. Meaning, when I multiply the normal distribution values by 5,000, they’ll be comparable to the histogram values on the same axis. Also, they’ll sum to 1,000 matching the number of values in our population. 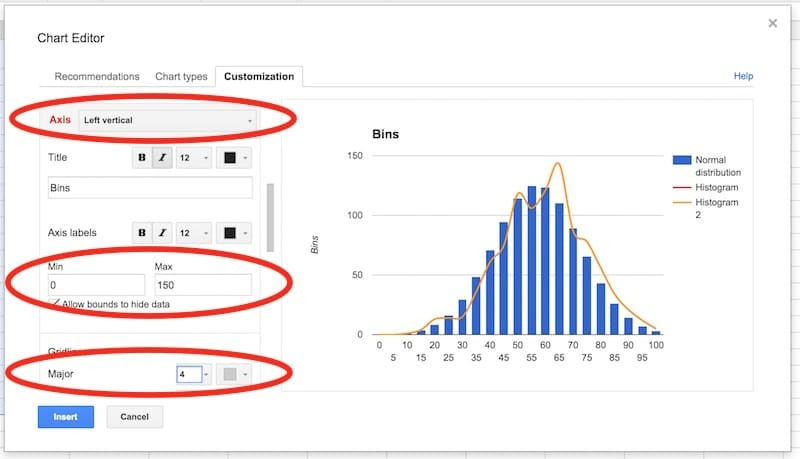 This is where we see how to make a histogram in Google Sheets finally! Note: the screenshots shared below show the old chart editor. The new chart editor opens in a side pane, but the steps and options are essentially the same. Select the vertical axis. Delete the axis name. Set to have a range of 0 to 150, and set the major gridlines to 4. Want your own copy of this histogram chart? To conclude, we can see our exam score data is very close to the normal distribution. Hooray! If we look closely, it’s skewed very, very slightly to the left, i.e. it has a longer tail on the left, more spread on the left. See how there is space between the red bars and the blue line on the left side, but the red bars overlap the blue curve on the left side. It’s subtle though. This thread is outdated. 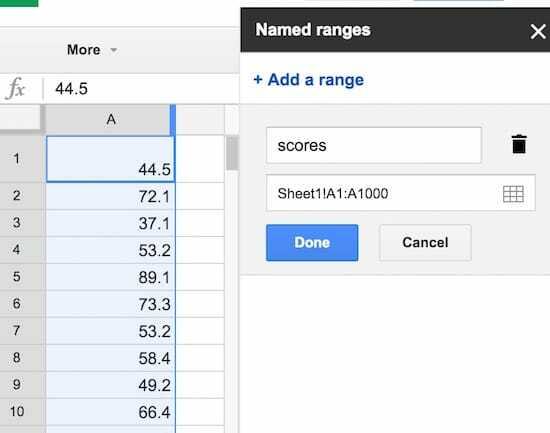 You do not have *smoothing* anymore in Google Sheets. I hope you update it soon. Hi Ben, Do you know how to make a histogram when I have a theoretical ‘Engagement Score’, a continuous variable, in Col A and counts of a given score in Col B? 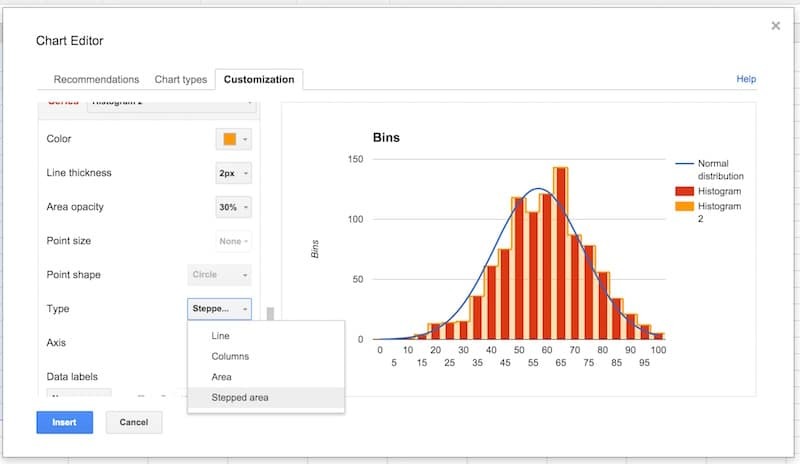 You’ve shown an elegant way to produce a histogram based on raw data at an individual user level. 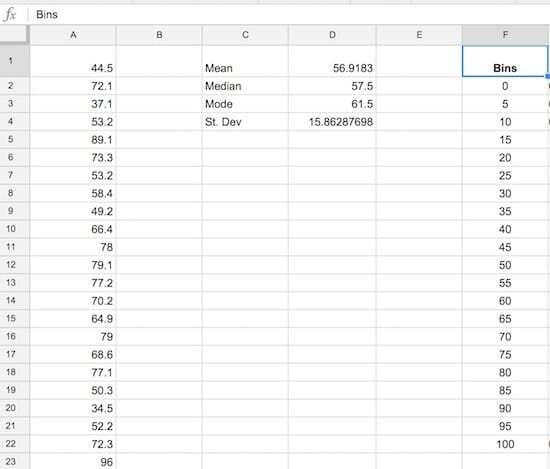 The data I have is at an aggregate level and instead of Engagement Score of 18.8 listed out in 1,000 rows, I simply have a2 = 18.8 | b2 = 1000. 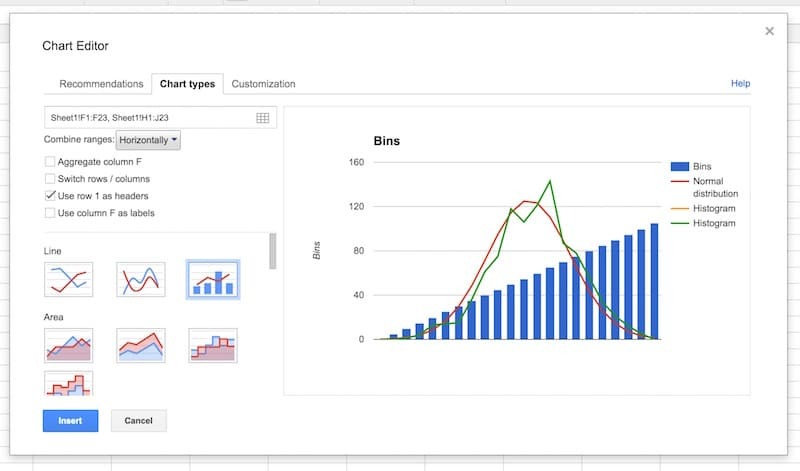 How should I manipulate my data to be able to create a histogram in Google Sheets? However, after the creation of the ND, I see false input in the Advanced settings’ Chart types’ first box where is only one column, while I expect there to be two columns. Can you please be more precise on the step 6 because I cannot reproduce your method. To get the bars and line on the same chart, look at the remainder of the tutorial, especially point 10 when I show that. Assume you have real values (negative, positives, zeros) in Scores and the bin width is real number (etc 2.93) so bins (0, 2.93, 5.86, …). I get a big tail of zeros by your method in Histogram 1 but everything else seems to work. So I think =arrayformula(frequency(scores,bins)) cannot be applied like that. There may be needed a shift. Can you please extend your thread about it? This was super helpful and made for a really neat chart. I learned quit a bit, thank you! Thank you for a tutorial that was clear and concise. 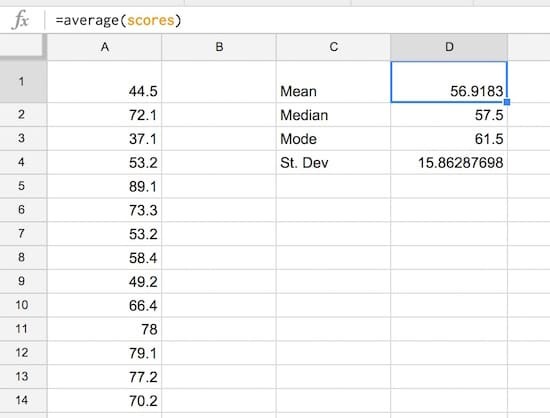 1) What is the difference between “STDEV” and “STDEVP” when calculating the standard deviation for a set of raw datas? 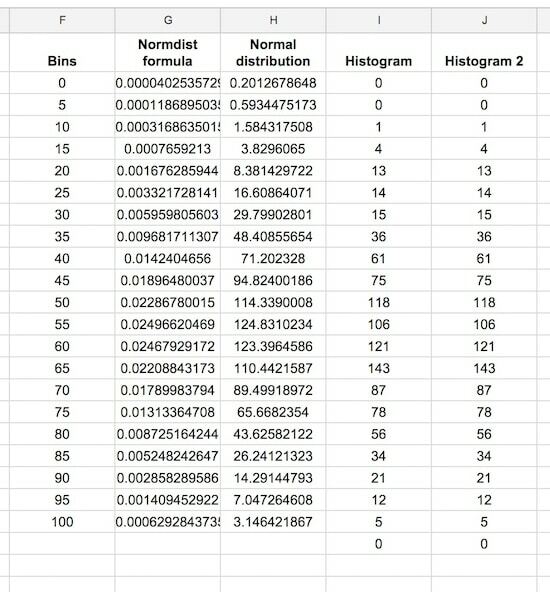 2) Are the “bins” listed and plotted just for because we want to create a histogram alongside the normal distribution curve? 3) Good question. So you want the bins to be the same size and cover your whole dataset. It’s advisable for them to be whole numbers too, both aesthetically and to ease understanding. As a starting point, you can take you max value (99.2 in this example) and min value (9.7 in this example), calculate the range between them (89.5) and then divide by how many bins you want to show (e.g. if you want to see 20 bins, then divide by 20 to get 4.475, which I’ll round up to 5 to be my bin size, which will cover me from 0 to 100). 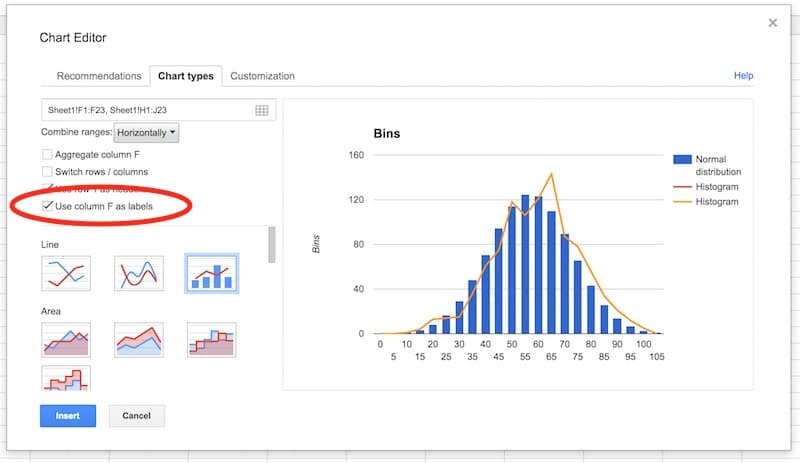 The number of bins you show is up to you – enough to show some detail or trends, but not so many that it stops being a histogram and turns into a regular column chart. 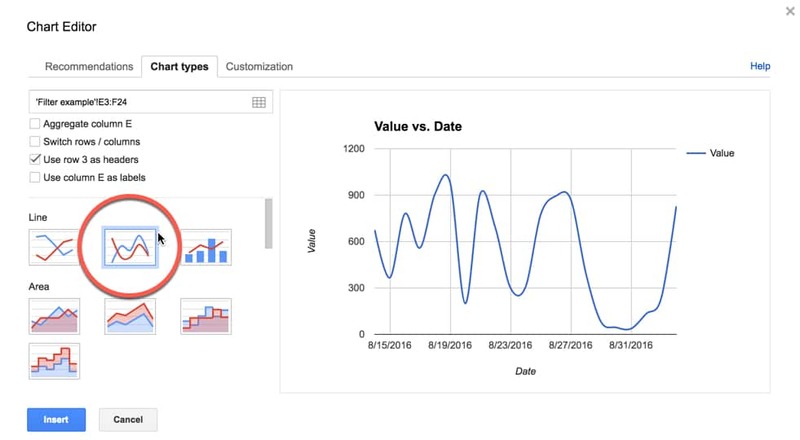 I’ve added some notes to the “Charts” tab of the Google sheet here. Fantastic tutorial. Thank you. The use of FREQUENCY instead of COUNTIFS to fill up the histogram frequencies is particularly good. This was a great exploration for me, both in learning more advanced charts (advanced for me, at least!) and in analyzing student data. Thank you! #NUM! comes up when I try to use the normdist formula for some values. What does this mean? How can I make it work? (I’m not using the data you’ve provided for the tutorial). Hmm, difficult to know without seeing your data. The #NUM! error means that the formula is trying to use values that are not valid numerical values, so it can’t compute the normal distribution. After selecting a combo chart, I am not getting the “Smooth” option. Do you why this is the case? Seems the new chart editor does not have the “smooth” option for the combo charts, but you can click “Use the old chart editor” at the bottom of the sidebar to go back to the old editor which does still have the smooth option. Hi Ben, this is great. 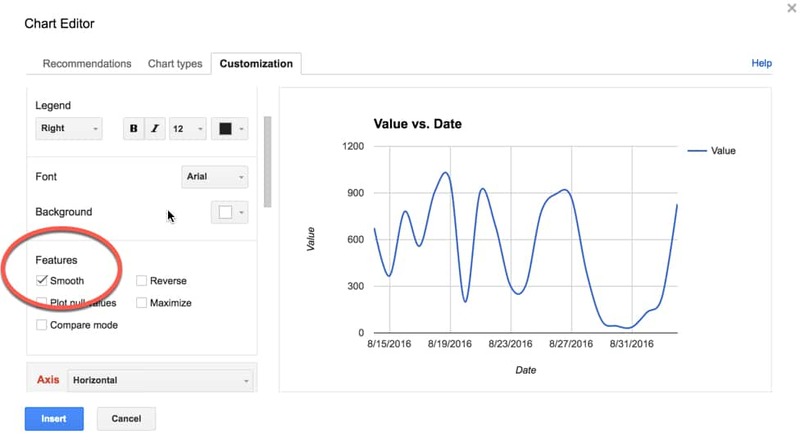 Are you able to do this using the native Histogram charts in Google Sheets instead of using a combo chart option? 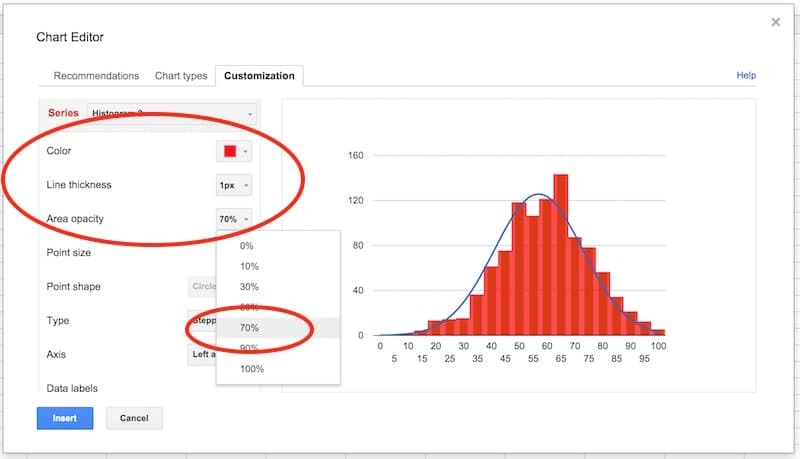 No, unfortunately you can’t overlay a normal distribution curve with the native histogram chart. However, it is a much quicker method to create a histogram that way. 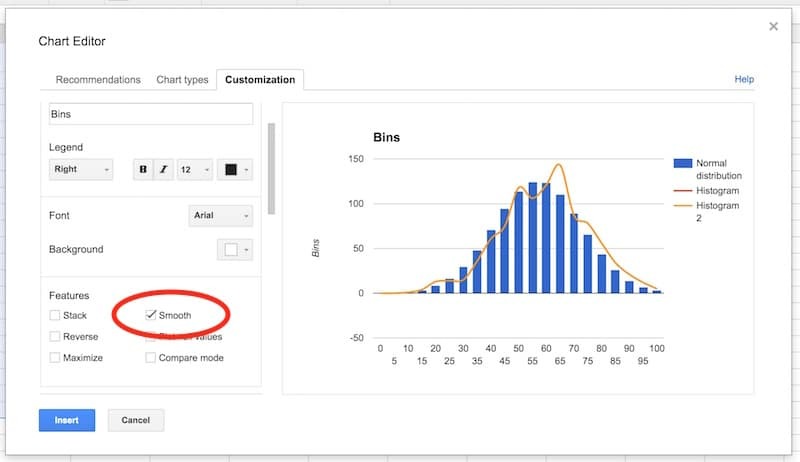 Do I need to Identify first the range of my data for me to get the bins? Yes, and you can use MIN and MAX to do this to get the range. Then you’re free to choose sensible sized bins (not too narrow, not too wide). Should I always start my bins with 0? Can’t I start it with the value closer to my lowest data? Thanks! Hi! Yes, you can start your bins nearer to the lowest value provided you don’t miss any data! However you should not truncate the y-axis (vertical axis) because the height of the bars is measured from zero and this prevents the data being distorted. This is super helpful, not simple. However it gets the job done in clear and concise steps. How to calculate the Scale Factor? I have 78 values in bins of 0.005. Is the Scale Factor 0.39 (78 * 0.005)? 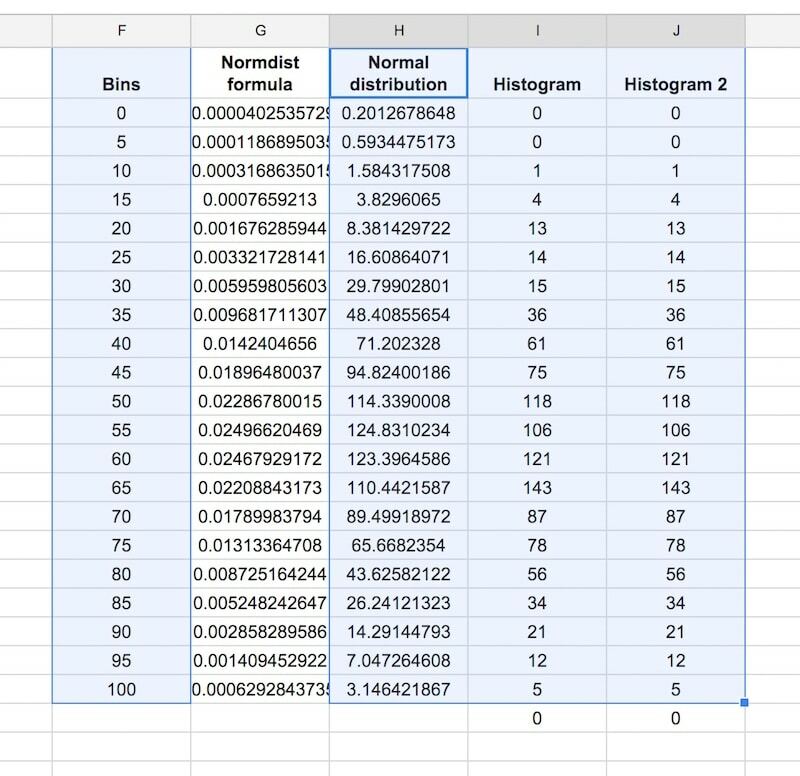 If this is the way to calculate, I’m not getting comparable numbers between the Histogram and the Normal Distribution columns. Thanks for the great tutorial!! What if you are trying to compare your data not to the normal distribution of your data, but say the district’s average? If you were told your district had a mean of 75% with a standard deviation of 15, is it possible to create a combo chart with your data overlaid with the district data? Hi Ben! This is some really useful stuff. I’d been a google sheets skeptic until I read through some of your posts. Thanks for setting it up, it’s helped me become way more productive! One quick note – I think the text for normal distribution theorem should be slightly different? Because this weak law of large numbers actually holds true only for iid random variables. You are using a built-in NORMDIST function to fit the data, but how to modify your procedure to fit an arbitrary function, such as the two- or three-parameter Weibull distribution, to a skewed data set?